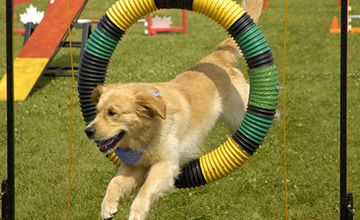 Beginning Agility is the Level 2 class after Intro to Agility or after Puppy/Adolescent Agility if your pup is old enough (a year and up). 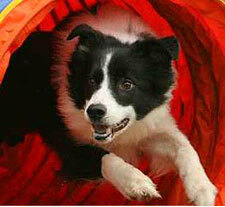 In Beginning Agility, handling skills and basic control will be improved. Students learn to give timely commands, to provide consistent and smooth body cues, and to develop teamwork with their dogs. Handlers also develop the ability to switch smoothly from handling their dogs off one side to handling off the other in the middle of a sequence using techniques such as the front and rear cross. Other handling maneuvers may begin to be taught such as the 180, 270, and serpentine. All of the equipment will be practiced at the appropriate height to build confidence in your dog, including A-frame, teeter, and dogwalk, and contact equipment safety and behavior will be emphasized. The dog and handler teams will continue to improve their skills and will become more proficient at simple combinations of obstacles.